“Want to take a ride?” Those were familiar words growing up, as my father always enjoyed a drive through the country, at any season of the year. While mom always went along, she never enjoyed them as much as father and daughter. Since we liked to explore all the back roads, mom came to calling us “gypsies”. The passion for exploring has never left, so now you know a little background for my blog, Gypsy Road Trip. 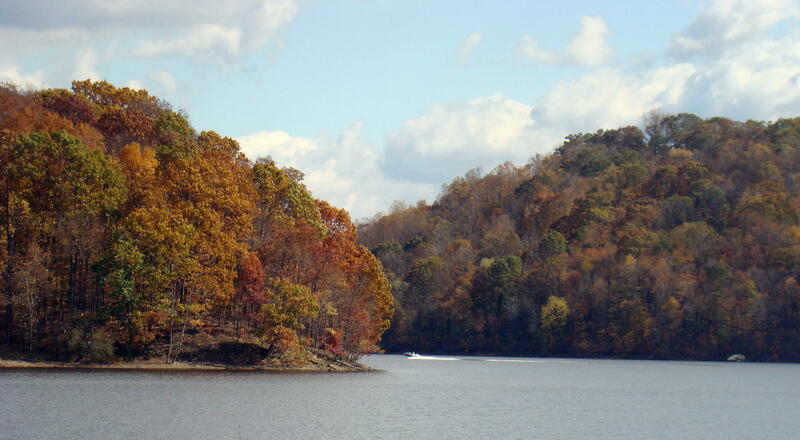 This beautiful autumn Sunday Drive in the hills of Southeastern Ohio began at the dam of nearby Salt Fork Lake. With fluffy clouds in a bright blue sky, the shades of autumn leaves were reflected off the calm lake. Tranquility surrounds you here interrupted only by the distant sound of a speedboat sliding through the waters. Sit and soak in the sun and grab some fresh ideas floating through the air. 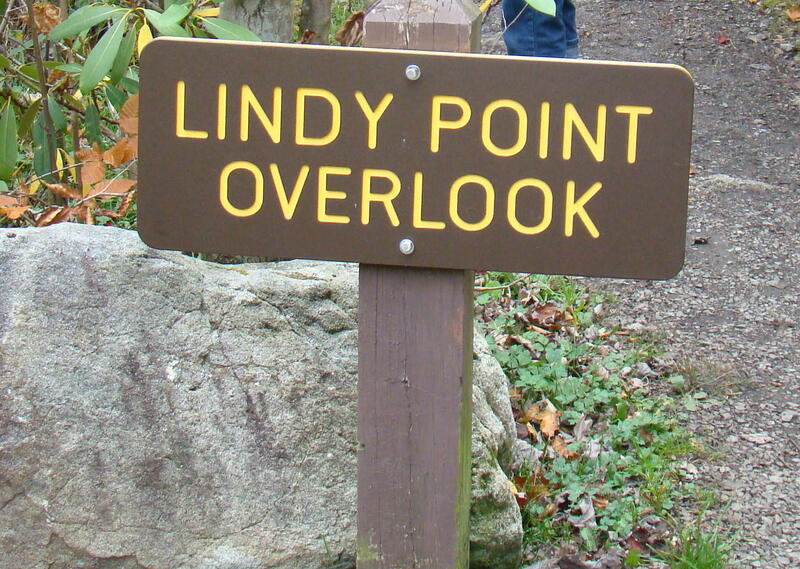 Sunday Drives are aimless ventures and who knows where the next random turn will lead. 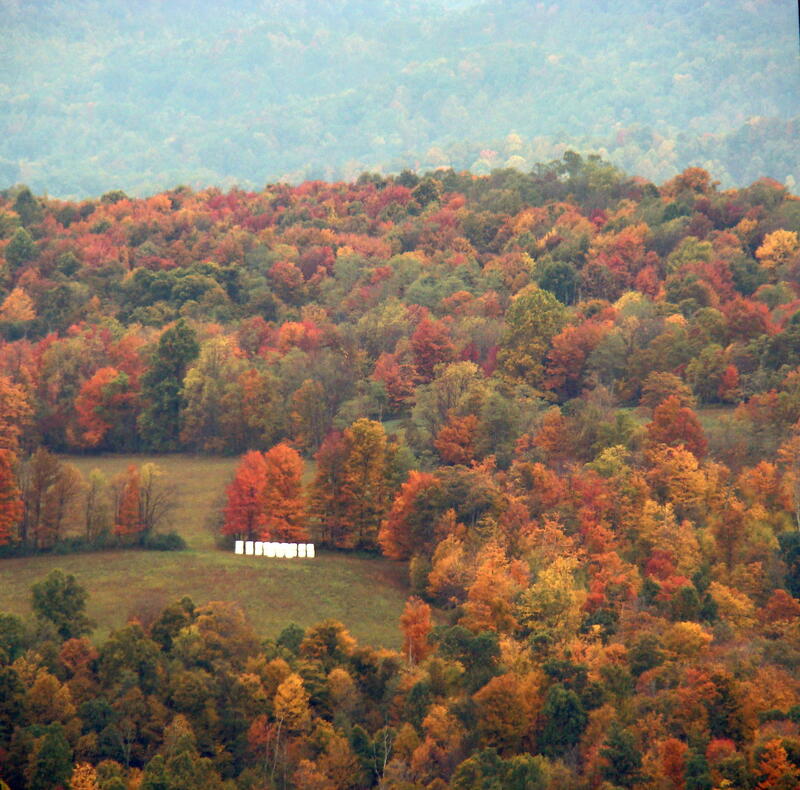 Along the side of the road the autumn colors catch your eye where a large red and white striped tent is fall home to Center Creek Farms. 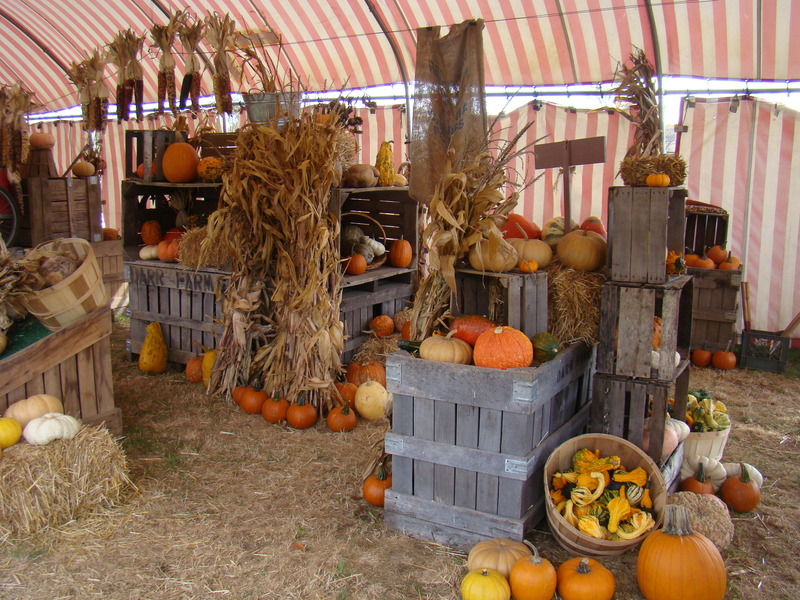 Here families stop to let their children explore the scarecrows, pumpkins, and wagons that are all part of the fall scene. There is even a pick-your-own pumpkin patch so everyone can see pumpkins at their various stages from green to orange. No roadside stand at this time of year would be complete with out apple cider, preserves and honey. Bought a jar of local raw honey as it’s always good to ward off a cold when a sore throat first starts to develop. 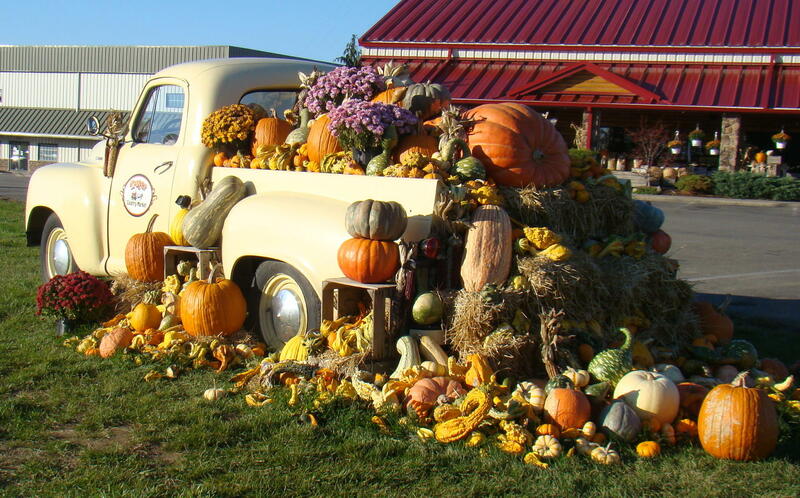 Farther down the road, an old Studebaker pickup is loaded down with autumn treasures at the Troyer’s Country Market. 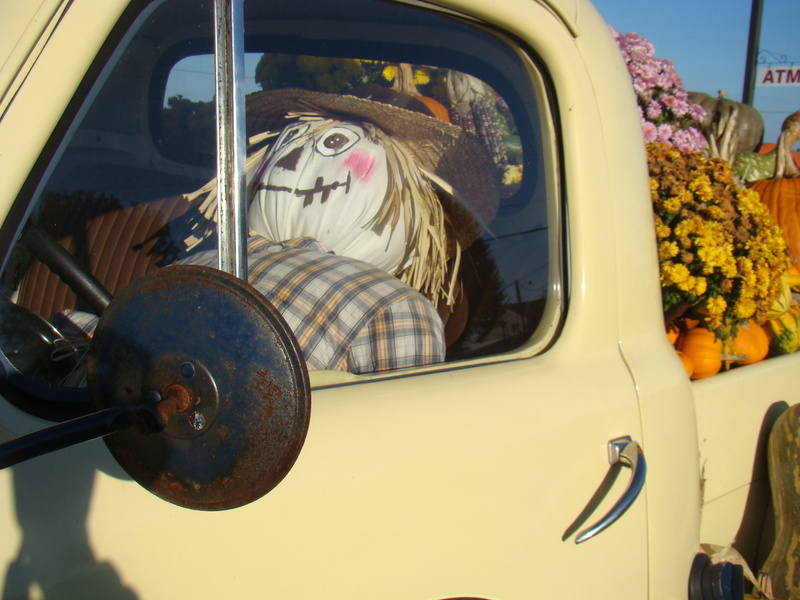 There’s a cute scarecrow driving this load of beautiful mums, pumpkins and other autumn decorations. Mums were brought to the United States back in colonial times and colors range from the traditional yellow shades to oranges, purples, and pinks. Since they are ‘short day plants’, chrysanthemums bloom in the autumn when the nights are longer. A pot of beautiful mums will brighten your life, or the life of a friend, for perhaps several months. Sometimes a single tree can catch your eye as it glows like a ray of sunshine. 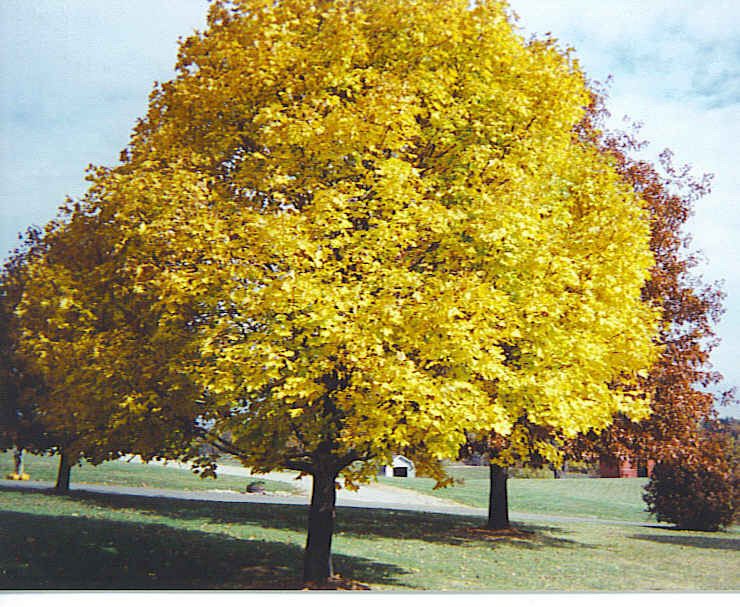 Here a golden maple tree is the center of attraction in someone’s beautiful yard. 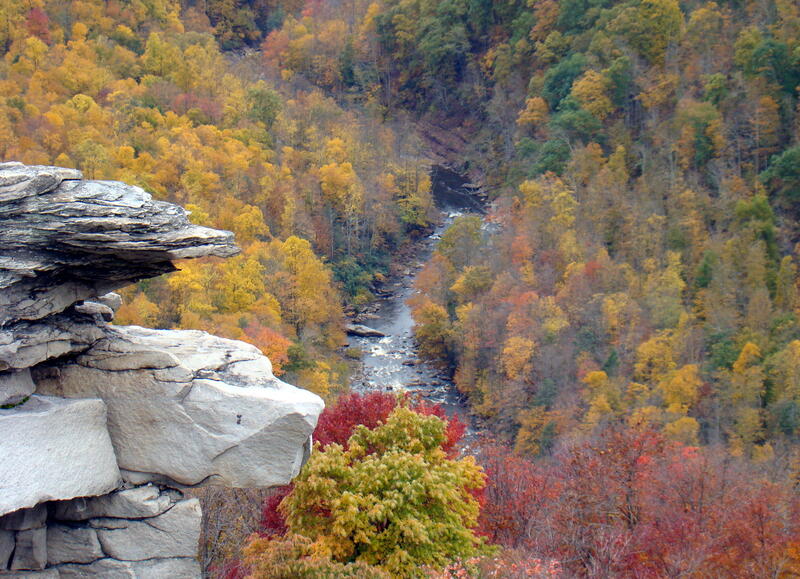 Temperature and moisture are the two elements that determine the amount and intensity of autumn colors. 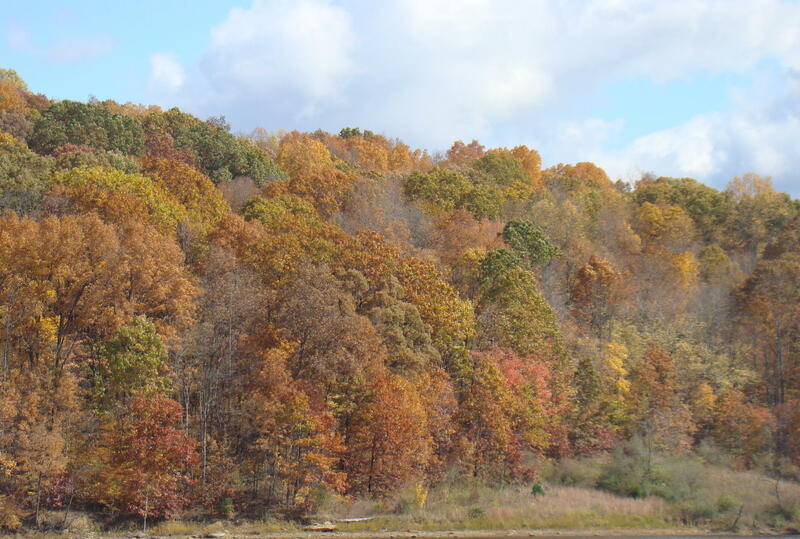 The most beautiful colors occur when there is a series of warm autumn days with cool, but not freezing nights…following a year of a warm, wet spring with normal summer rainfall. 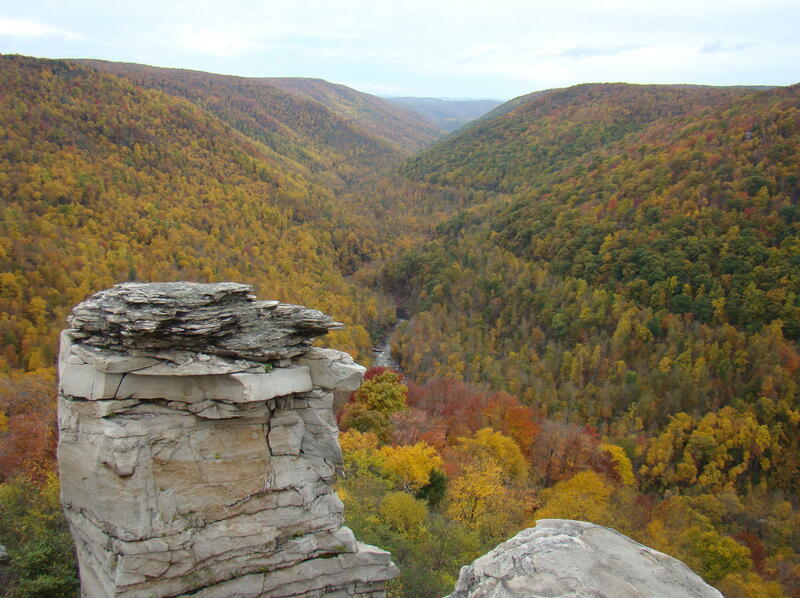 With those determining factors, every autumn brings about a new spectacular display. Had to top off the day with a stop in West Lafayette at a favorite ice cream stand. 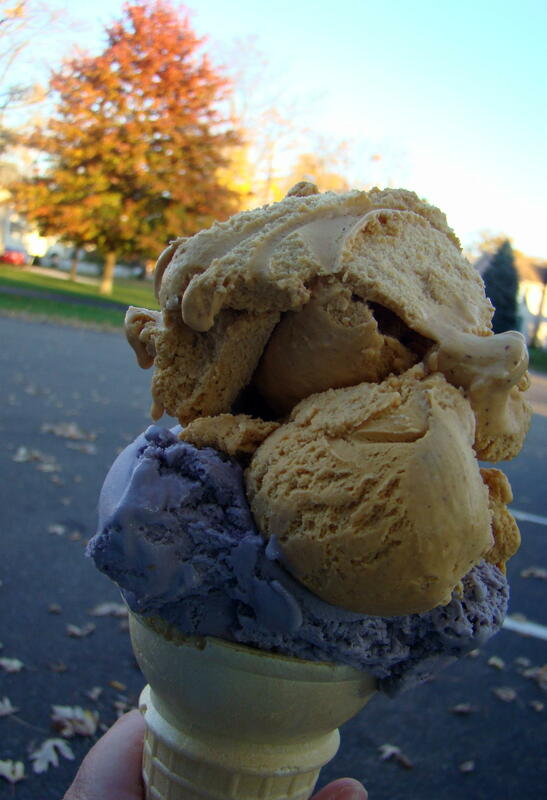 Noticed that keeping with the season they had pumpkin ice cream, so had to give it a lick. Wasn’t sure if the pumpkin would be something to my taste, so had them put a scoop of raspberry on the bottom so there would definitely be something deliciously satisfying. Both flavors hit the spot! Any season of the year is a great time for a drive through the countryside wherever you happen to live. 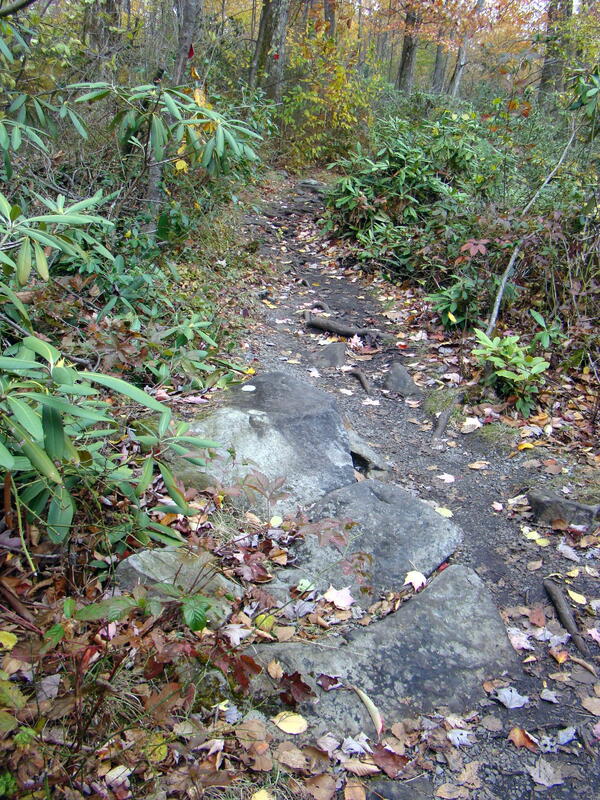 If for some reason you can’t take a drive, stop back and read another gypsy jaunt here on Gypsy Road Trip. Enjoy the adventure!